Are you in denial? 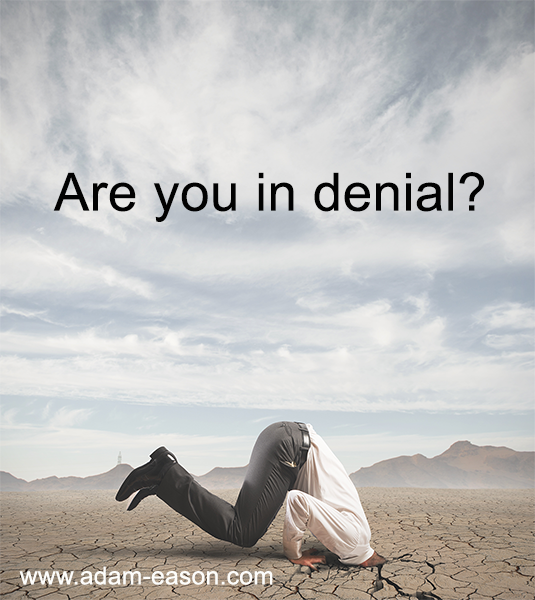 Read about how to get over being in denial. “It takes a lot of courage to face up to things you can’t do because we feed ourselves so much denial.” – Zoe Saldana. We’re all in denial. We’d barely get through the day if we worried that we or people we love could die today. Life is unpredictable, and denial helps us cope and focus on what we must in order to survive. On the other hand, denial harms us when it causes us to ignore problems for which there are solutions or deny feelings and needs that if dealt with would enhance our lives. Unfortunately, if you’re in denial, you won’t usually know it. I see it in my clients, I see it in my students, I see it in fellow hypnotherapists and I see it in myself. Therefore, I have chosen to write about denial today and help anyone learn how to recognise denial in its many forms. When it comes to codependency, denial has been called the hallmark of addiction. It’s true not only for drug or alcohol addicts, but also for their partners and family members. This axiom also applies to abuse and other types of addiction, but is just one example, used here to illustrate. We may use denial in varying degrees. • First degree: Denial that the problem, symptom, feeling or need exists. • Second degree: Minimisation or rationalisation about it. • Third degree: Admitting it, but denying the consequences. • Fourth degree: Unwilling to seek help for it. Thus, denial doesn’t always mean we don’t see there’s a problem, we might rationalise, excuse, or minimise its significance or effect upon us. Other types of denial are forgetting, outright lying or contradicting the facts due to self-deception. Deeper still, we may repress things that are too painful to remember or think about. “We live in a world of denial, and we don’t know what the truth is anymore.” – Javier Bardem. • Do you think about how you wish things would be in your relationship? • Do you doubt or dismiss your feelings? • Do you believe repeated broken assurances? • Do you conceal embarrassing aspects of your relationship? • Do you hope things will improve when something happens (e.g., a holiday, moving, or getting married)? • Do you make concessions and placate, hoping it will change someone else? • Do you feel resentful or used by your partner? • Have you spent a number of years waiting for your relationship to improve or someone to change? Or do you idealise/fantasize when a good thing happens and generalise it into your entire attitude? • Do you walk on egg-shells, worry about your partner’s whereabouts, or dread talking about obvious problems? “I’d be like, ‘You’re a young, vibrant woman. Where are you?’ I realized that I had been living in denial.” – Lorraine Bracco. How to Stop Living in Denial? When faced with an overwhelming turn of events, it’s OK to say, “I just can’t think about all of this right now.” You might need time to work through what’s happened and adapt to new circumstances. But it’s important to realise that denial should only be a temporary measure — it won’t necessarily change the reality of the situation. Failures come in many shapes and sizes. Their affects can be small or life changing. It’s incredibly difficult to come to terms with your failures, own up to them and talk about them openly. It takes courage. Accepting reality and coming to terms with what happened is potentially one of the hardest things you’ll ever have to do. But, if you dig down deep and find the strength from within to bounce back, you will eventually figure out what is next. So, stop focusing on your weakness and double down on your strengths. – How to Bounce Back From Being Knocked Down. – Why is self-compassion important? And how to advance it with self-hypnosis. Being true to yourself is built on the foundation of honesty. Tell the truth and not just to other people, but to yourself as well. Learning how to be true to yourself is all about transparency and honesty. Are you really happy right now? Is your life as you imagined? Sure, you are probably able to deceive yourself as well as others for a little while, but reality is that the truth will eventually come out, so you might as well be honest from the get go. Of course truth can be hard, but it’s also true the truth will set you free. – Why You Need to Discover Your True Self – And How To Do So. Just because you decide to be true to yourself doesn’t mean that fear is magically going to disappear. Fear will always be there, whether you are living the exact right life or not. Learn how to manage your fears, especially on the level of the body. Various breathing exercises can be extremely helpful in managing fear as does kind self-talk, cognitive therapy, and keeping sugar and caffeine at a minimum. Find out what works best for you to manage your fear and stock your fear management toolbox with it. 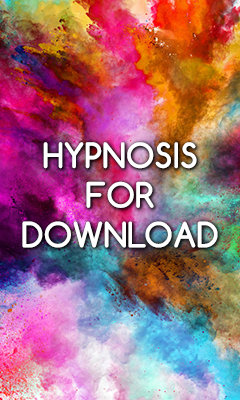 – Stop Catastrophising With The Help Of Self-Hypnosis. – Tame that inner critic. – Torching, Flames, Burning and Getting Fired Up Using Hypnosis. If your denial comes with feelings of anger or extreme disappointment, it’s okay to feel those things! A lot of us tend to repress our emotions, but that only disconnects ourselves from ourselves and leads to inner numbness. And the more we bury our emotions and feelings, the more they can lead to an explosion of rage, nervous breakdown or physical as well as mental illnesses. In order to be true to ourselves, we need to connect to our emotions and feelings and explore what is going on inside ourselves. Express your emotions and feelings in a healthy way, whether that’s through screaming and shouting, laughing, crying or anything else that actively includes our body. Be gentle with yourself, allow your emotions and feelings and realise that emotions and feelings are a healthy and vital part of you. It’s not enough to accept you’re in denial. To overcome it, you have to do the footwork. Rediscover who you are. Explore your emotions, feelings and thoughts and write them all down or find another way to express them whether that’s through movement, art or any other creative form. Simply allow yourself to reconnect with who you are on the inside. Set aside at least 10 minutes each and every day for self-discovery and familiarise yourself with what’s going on with yourself. Think about how your life will be in one year or five year’s time, if you do nothing and implement no change. While denial is the first stage of grief, don’t get obsessed with following the stages. Everyone deals with things differently, and there’s a good chance you may find yourself skipping around. Work through things in your own healthy way and ideally seek some professional assistance and support with it if it is too much for you to work on alone. Try to spend time with someone whom you love to work through the issue. At the same time, let the person know that you’re open to valuable suggestions. Your loved one may even be relieved when you bring the issue up. If you can’t make progress dealing with a stressful situation on your own — you’re stuck in the denial phase — as I said, consider talking to a mental health professional of some kind. He or she can help you find healthy ways to cope with the situation rather than trying to pretend it doesn’t exist. Likewise, if you’d like to learn more about self-hypnosis, understand the evidence based principles of it from a scientific perspective and learn how to apply it to many areas of your life while having fun and in a safe environment and have the opportunity to test everything you learn, then come and join me for my one day seminar which does all that and more, have a read here: The Science of Self-Hypnosis Seminar. Alternatively, go grab a copy of my Science of self-hypnosis book, it’ll help you live with getting over denial! My pleasure Sarah, thanks for taking the time to write and say so. Best wishes to you, Adam.